I just turned 64, also planning on another 5 - 8 years (minimum) of solo tripping. Morning: get up, sit around for 15 minutes, make tea, make breakfast, have a look at the maps for the day ahead, get dressed for the water, pack up, take down shelter, load boat, stare at nothing in particular head out....lucky if this only takes three hours. Evening: Arrive at camp, survey camp, set up, sit and relax, make tea, get high, make dinner, get high, eat dinner, get high, write up the day in my journal, study maps and plan for the next couple of days travel, get high, listen to music, make more tea, snack, get high, arrange bedding, send messages (InReach), get high, off to bed listening to music....this can easily occupy 5 hours. On a layover day, substitute camp set up and other things I don't need to do on a layover day with sleeping (10 hours instead of the usual 8 - 9), afternoon nap of an hour or two, write more in my journal, re-organize gear.....I rarely end up with any spare time. I use a large bug/rain shelter which allows me to have all my gear close at hand even in bad and/or buggy weather so little tasks like reorganizing or repairing can be done any time. I often spend an hour or more writing in my journal every day and I can spend another hour looking at maps. My suggestions.......write a detailed journal, study maps/notes and of course smoke more dope! I'm 79 years old and have slowed down some but still get out for at least a week by myself every summer. Usually late August or early September. The most difficult thing I find is portaging because of an unrepairable torn ligament in my right ankle. 30 years ago we moved to a home in the country with good acreage where I have made mountain bike/hiking/snowshoeing trails and I also spend a lot of time in our woodlot cutting and preparing the 20 + cords of wood for our winters so my need to be alone and be in the bush have sort of been satisfied without the need to go canoeing in wilderness areas. The felling, debranching, cutting and hauling the firewood had kept me in relatively good physical condition. One reason I don't go on longer trips anymore is the fact that my wife is by herself during these absences and I don't find that very fair. My days on the water and around camp are similar to recped's except the getting high parts . Wish all of you olders folks many more canoeing adventures. Fishing can take up a lot of time on a canoe trip... one of the most pleasant ways to spend time is to troll the shoreline, you get to see the shoreline details and you never know what you're going to catch. Well, maybe you do if you've developed the expertise to know what all that water produces. And while you're in the middle of a wild area, why not eat some of it... preparing fish so it tastes good is something that also takes time. Binoculars while sitting around at camp are worth having, esp if you have a good view out over the water... one of the best buys I've ever made was to spend several hundred on good-quality optics... full-size binos, like 10x42, 8x42 are a little heavier but the brightness and color contrast add to the wow factor when simply looking at the detail in natural surroundings. And birds are incredible to watch when you can see the detail in every feather. Don't do much portaging anymore though last year we made it through Bowron Circuit in six days. We had a cart and the cart was a PITA.. the potholes were huge even though the cart had enough ground clearance overturning your canoe with 60 lbs in it was a multiple times a day event. We tend to stick to larger lakes and rivers sans portages in old age and use camp furniture. We have enough trips down there in the bucket to have happy days canoeing down the Green or the Yukon or out on the Maine Island Trail or Lake Superior. We usually are solo but paired solo. We do like the Everglades once a year for backcountry camping.. and lots of bird watching. With hubby unable to walk far due to a foot defect that could be fixed to some degree with a year of immobility ( and he wont do that) portages are pretty well out. He walks with right foot entirely rotated out sideways and walks on the end of the tibia. This just happened to us.. His sister died unexpectedly. We were in a remote part of Iceland and unable to get back. We are 72. There are no right and wrong solutions to how you might age.. I will say that I was soloing a large part of every year at 69 and none at all now because I do have a life partner with memory issues. Life deals everyone a different hand. Last edited by littleredcanoe on July 1st, 2018, 11:05 pm, edited 1 time in total. At 67 I just purchased a wooded lot on a private Adirondack lake where I plan to continue solo paddling and training for races in my future. I still instruct and just returned from an annual week-long wilderness guide training class in which I paddle my solo canoe many miles each day along side with students in their C2 canoes. I have been very busy in recent weeks clearing trees and cutting them into firewood to get ready for a new cabin to be constructed later this summer. I am about to enter my 22nd Adirondack 90-mile race, after completing my 3rd 440 mile Yukon River Quest last year (and the Yukon 1000 mile race twice in recent years - and I'm not done with any of those races yet). There is one guy well into his 80's who still beats the heck out of me on the 90 miler. I am 67 and have observed that my in camp hours have increased. Every eighth day used to be time for a layover and now a lazy fifth day feels good. Except for important reasons I linger and enjoy the morning, a thermos of coffee, padded rock to recline against and a nice view is good for a hour or more. I also like to hike and seek out lost portages to adjacent waters. Not much for fishing but it can give me another reason to spend more time exploring from the water. Journaling can be very rewarding but I tend to do it more via video clips now. Some editing and splicing and they let me relive the trip. That may really be nice after I hang up my paddle for the last time. I futz around camp a lot, collect and process firewood, often for the next fellow, take short day hikes, empty boat day paddle on lake trips and, as often as not find some interesting spot away from camp to simply sit quietly, look and listen. On salt water trips I can sit and watch the changes as the tide comes in or goes out for half a cycle while reading and writing. I keep a journal, not just of the day’s events, sites and routes, but of potential gear modifications or improvements & other ideas/inspirations. And a written record of the next few days weather if I can get a forecast on the weather radio. I am a couple years past the 60 mark, and if I don’t write an extended forecast down I will not remember the specifics like wind speed and direction, which helps with open water route planning the next day or days. On a Recped afternoon I can scribble some crazy journal ideas and have every trip journal going back to the early ‘70s; still crazy after all these years. Luckily my handwriting is so sloppy my descendants will not be able to decipher most of that babble. Birdwatching or native flora identification can while away the hours and increase your awareness and appreciation of the area. Pocket field guide or smartphone app. I much prefer a field guide book in hand, but smartphone apps play birdcalls for identification and potentially contain everything from birds to flowers to mushrooms to clouds. Cloud identification can help with weather forecasting. My all-time favorite device for dawdling in camp is a hammock. Not a sleep-in, rainfly-covered jungle hammock, just an inexpensive ENO or the ilk. Sets up in literal seconds and provides a nice view of the clouds and treetops, a lingering perspective not afforded in an upright position. Semi-hidden and motionless in hammock recline is the ideal place for pishing. Yes, I pish in my hammock. I have had some amazing bird experiences while pishing, and really miss that day repose hammock when in treeless areas. I have never done solo. My wife and I have pretty well eliminated portaging now that we are past 70. We have done quite a few trips on G Bay and never get tired of the place. I am 80, no arthritis, but flabby and poorly coordinated from a life of too much sitting and thinking. I paddle a Sawyer Loon, excellent design but poor execution in kevlar. Can no longer stand up straight so can no longer carry my 55 lb canoe on portages. Found dragging my boat entirely practical. I cover the parts subject to abrasion with duct tape. With few exceptions I have been a solo paddler for 50 years. I paddle to spend time in a rewarding environment rather than make time. Most liked river Marian in the NWT. Lots of fish and birds in early summer. I chop out the brush on the portages, knowing that I am walking in the path of hundreds of canoeists over many centuries. I bought a sound recorder but so far have not found time to deploy it. The ambience is world class. Waterfowl splashing happily, gulls wailing, the occasional loon, beaver patrolling their territory and going kawhump! and in the background the quiet lap of water against the shore. I use a sat phone to gab with friends. One summer I ran up a $1000 phone bill. I keep a diary, record every thing of interest. On rest days I make yeast bannocks, good with bacon and jelly. Not to enter forbidden territory, like kayaking, but I have recently entered into the love that we dare not speak of, yes, motors. 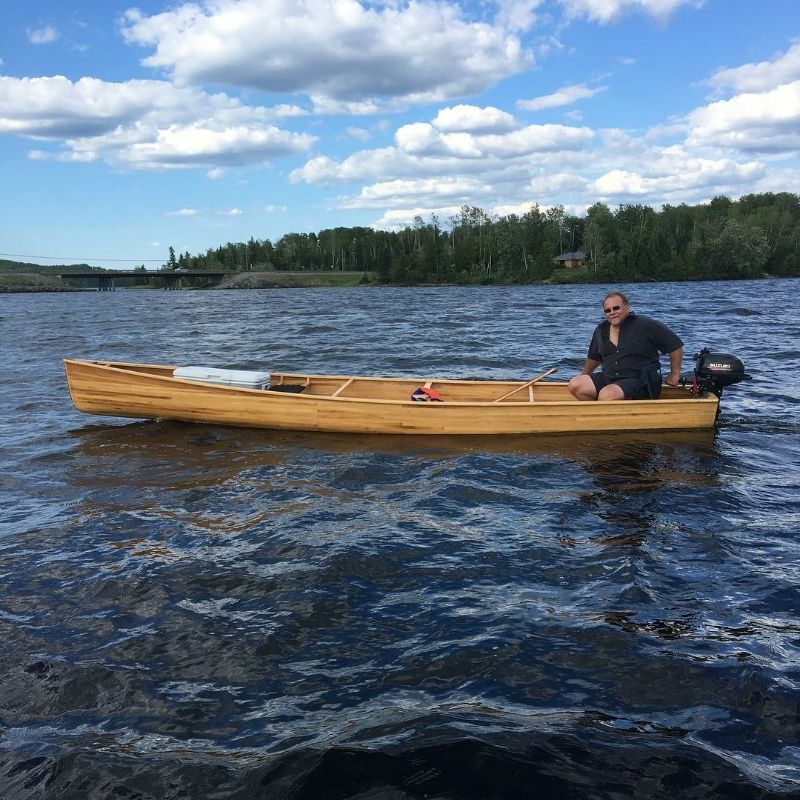 Although the canoe is over 100 pounds, I can still manage ports up to 600 meters (the longest I have tried yet), mostly because I am so fresh from motoring around instead of paddling. The little 2.5 four stroke suzuki got me around 90 k with five litres of gas on my last trip. There are (at least) two questions about soloing as we age.... one is retaining the physical ability, and another is how to fill the extra time on a slow trip. As for the physical, I highly recommend Taoist Tai Chi. https://www.sudbury.com/columns/mather/ ... ife-410025. I credit my now 8 years of practice for the ability to be flexible enough to squat down to get in and out of the canoe, to kneel comfortably, to paddle almost effortlessly, to portage over rough terrain, and sleep in a tent without being stiff or sore in the morning. I've seen people in their 70's come to the first class, shrunken and bent... within a few months, they are more upright, more balanced, more alert and active... in class and out. As for the 'how to fill the day', tai chi helps with that too. Relax! No need to fill every waking moment with activity. Watch the clouds go by. Observe the myriad of colours in the waves and water, forest and sky. Be at peace with yourself and the world. Taoist Tai Chi was developed to help people regain and retain flexibility. It is available in 26 countries around the world. http://www.taoist.org - - watch the video of Master Moy to learn what it can do for you and your body. Just too weird with the canoe bobbing around in the waves, watery sounds all around and just where is the shore anyway. All you see the the sky and clouds overhead and maybe hear some birds and damned people approaching thinking a canoe drifted away. Click here for watery sounds while napping. That 2.5 horse 4-stroke Suzuki is a great little motor. That motor canoe is a square stern Esquif Cargo in T-Formex, also 100 lbs of boat. You may need to carry some additional beverage weight in that cooler up front to bring the trim down, and need a two-holer Paddlers Console to hold your unmentionables.